A 27 year old male came with complaints of Jaundice for a duration of 2 months which was insidious in onset, gradually deepening in color, not intermittent and not associated with pain. He says his stool are lighter in colour than normal. He also had gradually distending abdomen from past 1 month and pedal edema -10 days. He now complaints of fever from past 2 days not associated with chills and rigors. He is a known chronic alcoholic but does not reports of any other medical illnesses. He is febrile on examination. Gall bladder or any lump is not palpable. Abdomen is moderately distended and mildly tender. His bilirubin total is 7.5 and direct is 3.8. Bile salts and pigments are postive in urine. SAP was found to elevated more than 3 times the normal value and mildly elevated ALT/AST . Usg Abdomen shows Ascites and chest X ray shows bilateral pleural effusion. 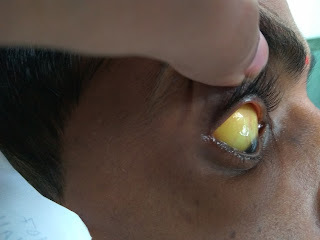 Q.1: What is the lowest level of bilirubin to detect jaundice in the sclera? Give your responses in the comments section below. Explanation to be posted tomorrow.